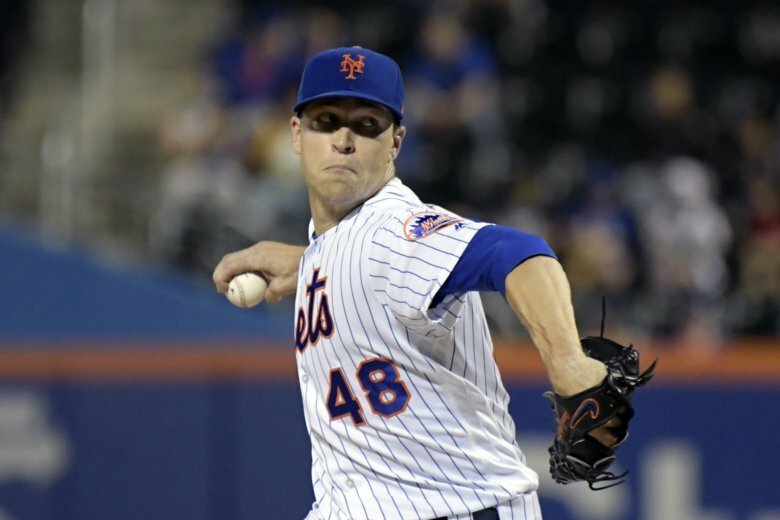 NEW YORK (AP) — NL Cy Young Award winner Jacob deGrom and the New York Mets agreed to a $17 million, one-year contract, a record raise for an arbitration-eligible player from his $7.4 million salary last year. The Mets reached deals with all six eligible players before Friday’s scheduled exchange of salary figures. Starting pitchers Noah Syndergaard, Zack Wheeler and Steven Matz, outfielder Michael Conforto and catcher Travis d’Arnaud also got contracts for 2019. DeGrom’s figure set a mark for a pitcher eligible for arbitration for the third time. Syndergaard agreed to a $6 million deal, doubling his salary. The right-hander went 10-9 with 269 strikeouts in 32 remarkably consistent starts for a team that finished 77-85. He can become a free agent after the 2020 season if the Mets don’t sign their electric ace to a multiyear contract by then. New York sounds open to a long-term deal under new general manager Brodie Van Wagenen, who was deGrom’s agent before switching sides and taking the front-office job. Talks could take place soon, though Van Wagenen has said he’ll recuse himself from negotiations involving deGrom to avoid a conflict of interest. Syndergaard’s name was often mentioned in trade talk early this offseason, with the Padres and Marlins among the teams said to be seriously interested. Van Wagenen didn’t rule out such a move at first, but eventually indicated the Mets plan to keep Thor at the front of a stingy rotation that is the foundation of the team. Finally healthy again last season, Wheeler ($5,975,000) is coming off a breakout performance in the second half. He was one of baseball’s most dominant pitchers from July on, going 9-1 with a 1.68 ERA in his last 11 starts — at last fulfilling the considerable promise that made him the sixth overall pick in the 2009 amateur draft by San Francisco. He finished 12-7 with a 3.31 ERA and 179 strikeouts in 29 starts covering 182 1/3 innings. The right-hander, who turns 29 in May, missed two full seasons following Tommy John surgery in March 2015. He returned in 2017 but that season (3-7, 5.21 ERA) was cut short after 17 starts due to a stress reaction in his pitching arm. Still, he beat the Mets in salary arbitration last February and got a raise from $800,000 to $1.9 million instead of New York’s $1.5 million offer. Matz, the Mets’ fourth starter, is 20-26 with a 3.98 ERA in 71 big league outings. The local kid from Long Island earned $577,000 last year and this was his first exposure to salary arbitration. Matz and the Mets are hoping he’s ready to take a significant step forward on the mound. The oft-injured d’Arnaud got $3,515,000 in a deal agreed to last month.